toxic particles that can cause asthma, lung cancer, and heart problems. Some of them are so small they can move into the blood stream. See below for air pollution deaths per year. And this is only in cities. Particulate matter is an air pollutant in the form of extremely small toxic particles. Inhaling them can cause asthma, lung cancer, cardiovascular issues, and premature death. Car exhaust is a major source of particulate matter and the problem is therefore worse in cities. Electric cars or cars with very effective filters can help reduce the problem. In some cities, the level of particulate matter is 8 times higher than the recommended maximum level. The mortality in cities with high levels of air pollution is 15-20 percent higher than in cleaner cities. Pregnant women's exposure to air pollution from cars can change the structure of the baby’s chromosomes leading to increased risks of cancer. Nearly 50 percent of the world’s population (or 3.2 billion people) lived in urban areas in 2006. As many as 2.3 billion lived in cities with a population over 100 thousand – over 3000 cities in total. The World Health Organization estimates a total of 865 thousand deaths in 2002 as a consequence of air pollution in these cities. We would like to give special thanks to Danielle and her science teacher Aaliyah Phillips at North Central Plains Charter School in Texas. Danielle provided us with the great overview of sources on the health effects of air quality you can find below. 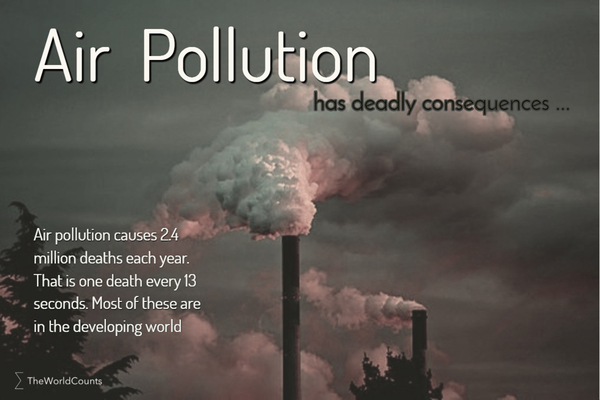 Interested in more facts like the deaths from air pollution in cities? Then plug in and subscribe to our newsletter.